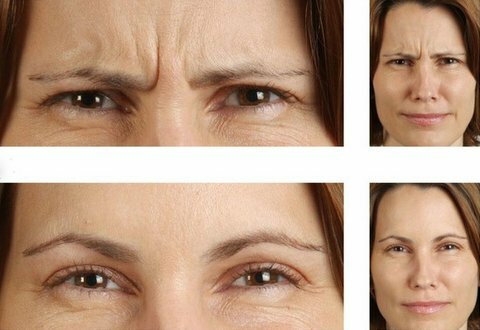 i) Dynamic wrinkles produced by overactive muscles as seen in frown lines and crows feet lines are best treated with a muscle toxin. This toxin produced by a bacteria, is injected into the contracted facial muscle producing weakness and relaxation within the muscle lasting 3 to 6 months. This excessive spasm of the muscles can be softened resulting in a smoother skin. ii) Fillers – synthetic compounds injected into the deeper layer of skin, the dermis or just below the skin. The main product is Hyaluronic Acid (HA) natural compound, reversible, lasting 4 to 12 months depending on the site. 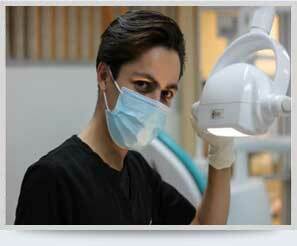 iii) Lipostructure – fat grafting. A technique of using the patients own fat / stem cells harvested from the abdomen, prepared then injected below the skin to fill out wrinkles and hollows. The procedure is safe and being the patient’s own cells there is no rejection/allergic reactions and can produce long lasting results. Wrinkle Eliminating Injections (injection of a chemical toxin produced by bacteria, into the over contracted facial muscles producing relaxation of the muscle) lasts 4 to 6 months. Wrinkles caused by the excessive spasm of these facial muscles resulting in elimination, softening of deep wrinkles and a smoother skin. 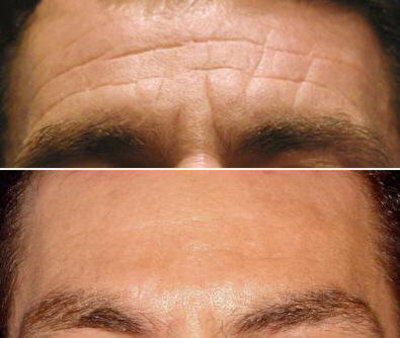 Examples – frown lines are removed, crows feet lines, lateral to the eye and forehead creases softened and smoothed to a normal appearance.